It's truly a lost opportunity that no one has yet done a documentary on Kate Middleton's life called The Princess Diaries. 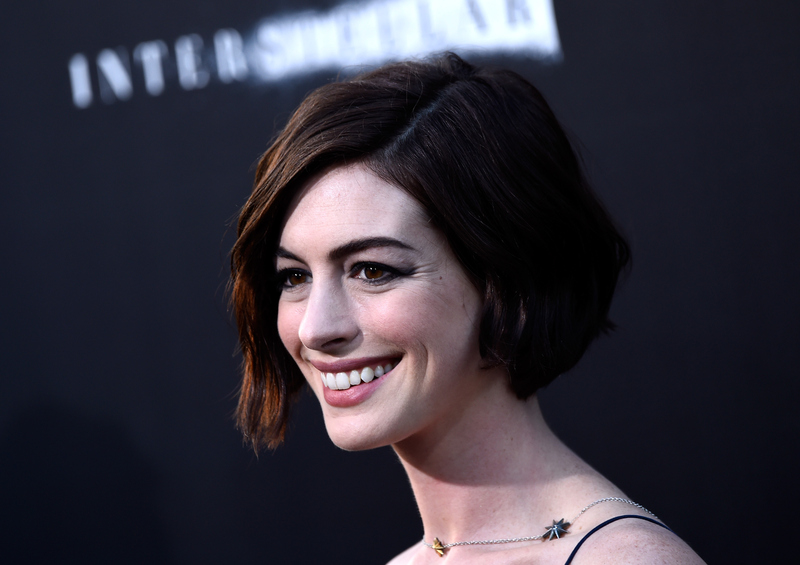 Especially now that Anne Hathaway has revealed that Kate Middleton is her favorite princess. Not that this comes as a surprise. We don't have that many princesses to choose from, at least none that make the news as often as Middleton does, and she's the first one that comes to mind without really having to dig through your knowledge of the royal families around the world. From marveling at her personal style to obsessing over every picture released of her and the new child prince, Middleton is probably everyone's favorite princess right now. Hearing it come from Hathaway, however, has a certain satisfaction to it. It's like her career is coming full circle. I still remember seeing Brokeback Mountain, a movie in which Hathaway appears full frontal, and then returning home to find that The Princess Diaries was on TV that same night. Lureen Newsome Twist was a far cry from Mia Thermopolis. If Mia knew that one day she would grow up to be a Hollywood starlet with a very fashionable pixie cut, what would she have said? Shut. Up. But when you think about it, Middleton and Mia have a lot of things in common, despite one of them being fictional. It's almost as if Hathaway knew, back in 2001. Or, rather, it's almost as if Meg Cabot knew, since she's the actual author of The Princess Diaries. Let's ignore, for a moment, that Middleton is actually a duchess. Mia was the heir to the throne of a small country called Genovia and was next in line if and when her grandmother stepped down. Middleton, as the wife of Prince William, will become queen when he ascends the throne. Of course, more people have heard of England than have heard of Genovia, but that's irrelevant. Middleton met Prince William when they were both students at the University of St. Andrews. Mia technically met Michael Moscovitz through her best friend, Lilly Moscovitz, but since Lilly and Mia attend the same school I'm willing to believe that they met there. Mia remained oblivious to Michael's feelings for her until the climax of the movie, which melted all of our hearts in a single line. Middleton and Prince William's relationship details are a little less public or cinematic, but if you didn't shed at least one tear at the royal wedding then you don't have a soul. In a sequel that I would rather forget, Mia and Michael broke up, Mia graduated from Princeton University, and she relocated permanently to Genovia. Michael and Mia breaking up on such a permanent basis was enough of a departure from the book series without adding, you know, the rest of the movie into the equation, but Mia ended up getting married to Chris Pine and that almost made it better. Middleton, meanwhile, also broke up with Prince William in 2007, but the two reconciled and were engaged by 2010. Their royal wedding was a lot more impressive than Mia's. In the only scene of the sequel worth paying attention to, Mia has about a month to find a husband to keep her throne. She and her friends start flipping through potential suitors and a photograph of 21 year old Prince William flashes up. Mia immediately accepts only to find out that he is ineligible because he's in line for his own throne. Nowadays he's ineligible for an entirely different reason. Kate Middleton saw to that.